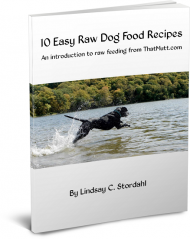 A raw dog food diet in general is exactly as it sounds – raw. Raw meat, raw bones, raw organs, raw fat and sometimes raw fruits and veggies. So, what are each of these “models,” and which is better? The BARF model stands for “bones and raw food” or “biologically appropriate raw food.” For most BARF feeders, this includes raw fruits and veggies following the belief that dogs are omnivores. 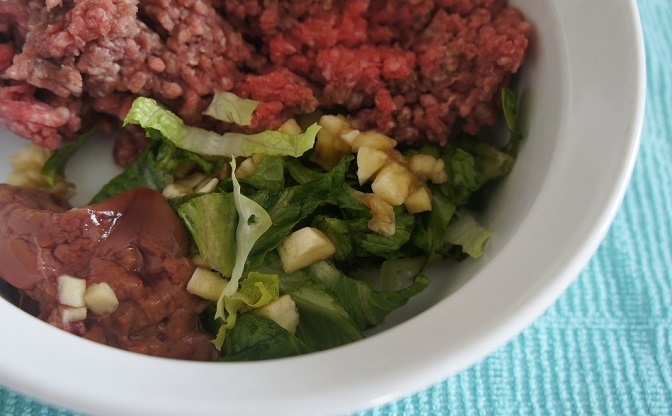 Some dog owners choose to make homemade BARF diet recipes for dogs, and others prefer to buy commercially prepared raw food for dogs. Nearly all commercial raw dog food contains fruits and veggies, and could generally be considered BARF diets. This model follows the belief that dogs, like wolves, are true carnivores. The whole prey model is an attempt to feed dogs as close to “whole prey” as possible with the understanding that dogs will get all the nutrients they need from their “prey.” No grain, fruits or veggies are necessary. In general, the overall goal is to feed about 80 percent meat, 10 percent organs and 10 percent bones, according to the Facebook group Raw Feeding (RF). For some, that means allowing the dog to help himself to an entire deer carcass. For others, a more realistic approach is feeding a whole rabbit or a whole chicken. For most, it’s probably going to mean buying supermarket meat such as chicken quarters, chicken liver, pork roasts, beef ribs, etc. Ground meat such as hamburger is generally not considered whole prey because it is not in its natural form. So which is better, BARF or whole prey? Ha! If only it were that simple! It is controversial whether or not dogs are omnivores or carnivores. I don’t have the answer to that. Personally, I feed a variety of foods to my dog, and I do not support either model. I feed my dog “meals” that fall under both models. One day, I might give Ace ground beef with chopped veggies and an egg. Another meal, I might hand him a pork roast or a turkey thigh. I don’t believe carbohydrates are harmful to my dog, so Ace’s raw dog food diet is probably about 10 percent fruits and veggies. I typically don’t feed him corn or other grains except for when it’s in treats. Hey, if I can have junk food every now and then, so can my dog! Like everything else, even the “raw dog food world” is divided. As usual, the best answer is probably somewhere in the middle. If you feed your dog a raw diet, I’m curious which model you tend to follow, if any. For more info on raw feeding, check out my raw dog food recipe guide. We follow the BARF model. Here I am thinking BARF means exactly what it seems to. Dogs are famous for eating their own puke, poop, whatever smells yummy. That diet sounds really gross to me, but it makes sense to dogs. Ew. Sadly, my poor pups still eat kibble. And duck poo. goodness, that bowl is good enough for a human to eat 😀 … and I guess that should be the barometer, just no salt … i love my labrador and she gets mainly fish as she’s prone to allergies with any other meat, which made me think about what’s in them (antibiotics, growth hormones, meds of all sorts). We feed whole prey. I give a lot of eggs, chicken bones, organs, fish heads, beef bones. The dogs have loved it. I like you feed a variety of things to my dogs. They do get fruits and veggies, raw meats and a little Orijen Kibble which is called biologically appropriate food! I also give them salmon oil, ground egg shells, whole dog daily sprinkled on food and occasional kefir and other probiotics. My dogs are prospering with tons of energy and shiny feel good coats. They are healthy and very happy….they get a lot of love too…THIS IS A BIGGY! Love your blog. Thanks. Prey-model here but the puppy does a wonderful job of vacuuming after the kids cereal or whatever else drops on the floor. Ella is doing a good job teaching the kids to *never* put down on the floor something they want to eat again. Oh gosh. Yeah, I hear ya. Everyone thinks they “know everything” about what to feed and what not to. Wish I had all the answers! Ha. We all do the best we can. I just started making the switch to raw feeding this summer and I think any raw you can incorporate into your dog or cat’s diet is better than none. I haven’t decided on a “model” so much as what makes sense for us and is easily accessible. So far, my dog is loving it and has way more of an appetite than he ever did on kibble, so we’re happy. I’m a vegetarian myself, but I know I’m going to enjoy the novelty of picking out weird-looking cuts of meat now for Hank. I have been feeding my new puppy raw food since she came home from the shelter. I lost my puggle a few months ago due to a huge tumor that had grown rapidly. I came across a post on feeding raw food and couldn’t stop researching everything I could on it. When my new dog came home I started her right away. She had a very dry and “dadruffy” coat and within on week it became soft and shiny with no flakes whatsoever. She loves her food and now my mom and sister feeds there dogs raw also. I wish I knew about it before I lost my puggle I think it would of helped her. I thought I was doing right by feeding her Blue. But when I found out how much sugar is in it I couldn’t buy it anymore! Sorry to hear your puggle died. 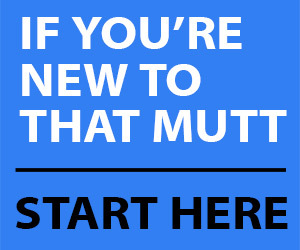 What kind of raw food are you feeding your new dog?